The adult male has grey upperparts and breast, contrasting with pale underparts and distinctive black wingtips. The adult female and juveniles of both sexes has brown upperparts and buffish-white underparts that are heavily streaked. All age groups and sexes have a prominent white rump. 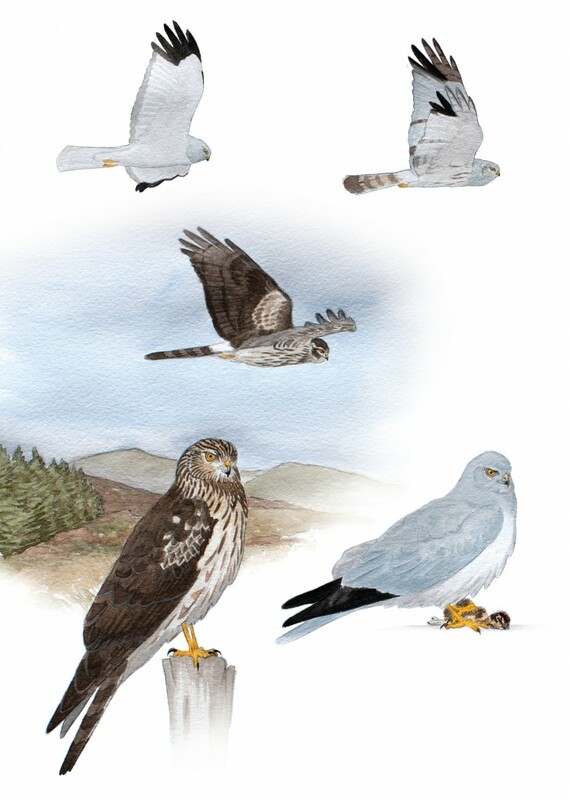 Hen harriers perform spectacular courtship flights called ‘sky dancing’ and males will often pair with two females in two separate nests, known as a polygynous mating system. This species can be found in the uplands during spring and summer where it breeds on open moorlands and in young forest plantations. It usually nests on the ground, although the rare phenomenon of tree-nesting has been recorded in Northern Ireland. In the winter it moves to open lowland areas and congregates at communal roosts. Its diet includes small birds, mammals, reptiles and amphibians. Threats include overgrazing, wildfires, disturbance, peat extraction, afforestation, persecution and collisions or displacement at windfarms.